Joni in the Spotlight Stamping: PLUNGING INTO THE "SPOTLIGHT"!! Spotlight Technique! This is an oldie, but I must admit I'd forgotten what it was!!! After doing a bit of research, I remembered doing this many times before-just not in awhile. So I was happy to be reintroduced to it!!! It's rather simple-it leaves the "spotlight" as the focus. See, the spotlight technique uses a small area that is "spotlighted" or highlighted with color. It's used as a way to "feature" an area on the image. It's not always stamped in black, but more often than not is. This lovely stamp set it Sweetbriar Rose. It's in the Annual Catalog! It's very pretty colored, but I thought it worked well for this technique. The sentiment is from The Best Day Ever from the Sale-a-Bration Catalog. Love that stamp set! Gonna miss this catalog!!! The circles were punched with the 3/4", 1 1/4", and 1 3/8" Circle Punches. 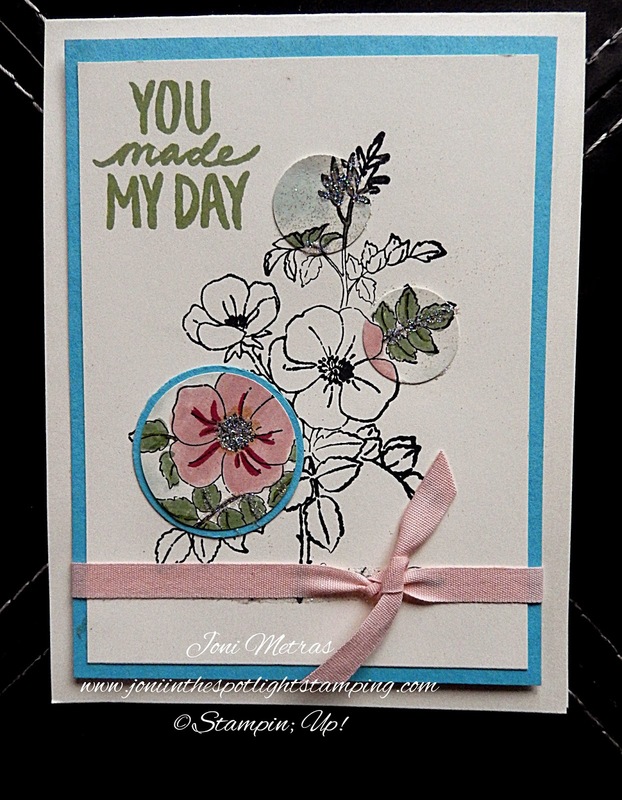 The image was colored with my Stampin' Markers. That's the only downfall for me right now-I miss my Blendabilities. Stampin' Up! though is so strong on their quality that they just felt they weren't cutting it, so they were removed from all catalogs. Too bad. I really liked them. They are researching alternative alcohol markers however, so we hopefully will have some nice ones to work with soon!!!! This image would have been much prettier if it were blended tho. Ah well. Life goes on! Other items used in this card are Black Stazon Ink, Dazzling Diamonds, 1/4" Cotton Ribbon. Now go pop on over the The Paper Plunge & check out what the other designers have in store for you! This is a fun technique. Go get some ideas & give it a try! Then post your own creation!!! Maybe you'll become a member of our "SwimTeam"!!! !